Spondylosis = various forms of spinal degeneration that accompany the natural aging process. Spondylolysis is a unilateral or bilateral bony defect in the pars interarticularis or isthmus of the vertebra. It represents a weakness or stress fracture in one of the bony bridges that connect the upper with the lower facet joints of the vertebra. The term spondylolysis is derived from the Greek words spondylos (vertebra) and lysis (defect). It can cause a slipping of the vertebra, in which case the term spondylolytic spondylolysthesis is used. • housing of neurological structures and control. 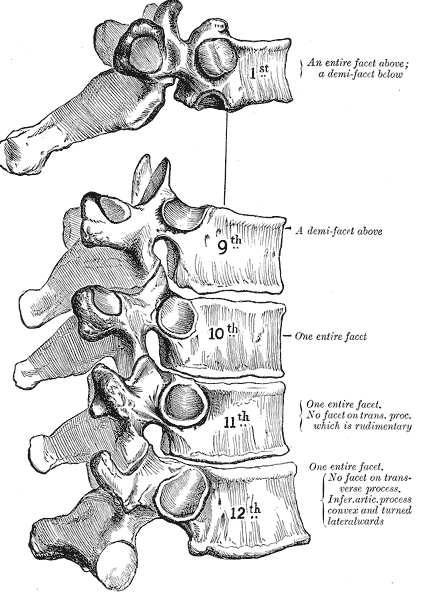 The spine is supported by ligaments and muscles (1). When there’s a gap between the vertebral arches, a vertebra slipping or sliding can arise. In this condition are the nerves and spinal cord in danger (3). This fracture can be the result of genetic predispositions (16 LOE: 4) including weak crossectional areas of the cortical bone area of the pars intervertebralis and relative cortical bone density (4,6) (4 LOE: 4) (6 LOE:1A). There is a possible genetic tendency for people with lower cortical bone density at the pars interarticularis. • sport and activities that require repetitive flexion-extension movements, such as football, dance, gymnastics, wrestling, swimming (2,3,6,12). • Excessive hyperextension forces is often associated with hypermobility. These factors affect the efficiency in which the neural arch absorbs forces (5 LOE: 1B). The terms spondylolysis and spondylolithesis are often switched with one another. Spondylolythesis is actually a health problem that follows on a spondylolysis. The early stage, which follows the stress fracture, is shows as a hairline on CT scans. If the spondylolysis can be found in the early stage. It can heal in osseously in about 90% of the cases within 3 months. This rate decreases in the progressive stage. At the begin of the progressive stage, the gap at the defect site is clearly visible. The terminal stage is similar to pseudoarthrosis, showing sclerosis at the fracture site. Even using CT scan, the early stage is sometimes very difficult to diagnose. A displacement of disc material beyond the intervertebral disc space. Lumbar pain caused by degeneration of the intervertebral disc. An articular disorder related to the facet joints and their innervations, producing local and radiating pain. Until now, no optimal tool for diagnosing spondylolysis has been identified. The most reliable method to use is a combination of various methods. However early diagnosis has been found to increase the likelihood of healing (25, 26: level of evidence 4). There are a variety of imaging tools that can be used to establish a spondylolysis. CT scans (computed tomography) , SPECT scans and [/www.physio-pedia.com/MRI%20Scans MRI] have all been found to be sensitive diagnostic tools for diagnosing spondylolysis (8, 27: level of evidence 2A). Amongst the literature however there is a big controversy as to which imaging method is preferential for diagnosing spondylolysis. Many papers suggest bone scintigraphy using SPECT to be the gold standard, followed by a CT scan (26, 28: level of evidence 4). Masci et al found MRI to be inferior to bone scintigraphy (with SPECT) or CT. This study acknowledges the conclusion of Standaert et al. that bone scintigraphy (with SPECT) should remain the first-line investigation, followed by limited computed tomography if bone scintigraphy is positive (27: level of evidence 3B). CT scans are able to distinguish between an acute or chronic spondylolysis and the type of fracture, which provides us with important information with regards to making a treatment plan. 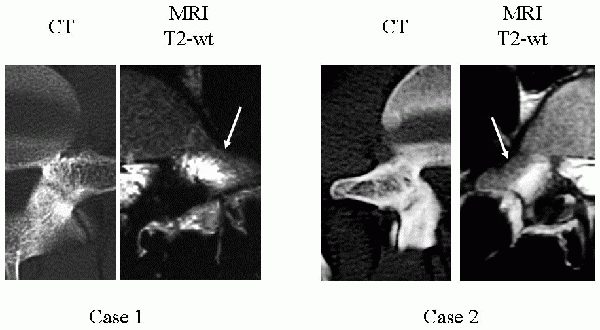 MRI is commonly used and often favoured because this imaging does not use ionising radiation. However, there is little evidence that supports its sensitivity in diagnosing spondylolysis. Neurological examination is usually normal in most of the cases, except when the vertebrae slips. , This slippage of the vertebra can cause neurogenic symptoms can to arise (1). It is highly recommended to apply conservative treatment methods to thoracic spondylolysis patients. Most symptomatic cases do well with conservative care. Many pars lesions may heal if managed conservatively, particularly those with early stage defects. The use of bracing in the treatment of spondylolysis has been controversial. Many authors advocate the routine use of braces in the treatment of these patients, while others don’t. One argument for this is that braces may limit gross motion and hence overal physical activity (delaying or complicating the health process), rather than to limit intervertebral motion in an effort to achieve bony healing. Pharmacological intervention includes the application of pain relief medications. The nonsteroidal anti-inflammatory drugs (NSAIDs) should not be ordinarily used because they slow down the bone growth and healing. If the patient is osteoporotic or osteopenic, alendronate sodium is a pharmacological alternative (2: Level of Evidence 2A). Once pain levels are controlled, pulsed ultrasound and therapeutic isometric contractions of surrounding musculature may be initiated to promote additional bloodflow. Through this way, the healing process is also facilitated. Moreover, the use of electrical bone stimulators seems to promote healing (8: level of evidence 2A). Surgical procedures typically attempt a direct repair of the pars which is sometimes accompanied by a fusion procedure. Specific surgical techniques such as translaminar screw fixation, cerclage wiring loop and pendiculolaminar hook screws preserve segmental motion by repairing the isthmic defect. 1. Laminectomy: nerve compression can be caused by an excess of cartilage where the broken bones try to heal. The loose lamina is removed to take the pressure off the nerve (6: level of evidence : 1A). After the surgery the patients are recommended to use a supporting belt or a brace and they have to be careful with resuming activities in the first weeks (9). In the early stage of the treatment, pain provoking activities should be avoided and relative rest is designated. El Rassi et al concluded that cessation of sporting activities for at least 3 months resulted in the most improved outcomes for symptomatic athletes with lumbar spondylolysis. (33: Level of Evidence 1B)The primary goal is minimisation of the biomechanical forces responsible for the propagation of the stress reaction in the pars. • Heat and ice (2: Level of Evidence: A2) ,(6: Level of Evidence: A1). -The first step is improving the healing and blood flow by therapeutic isometric contractions of the surrounding musculature and pulsed ultrasound. An electrical bone stimulator (internally or external) may also be used to promote the healing (7: Level of Evidence: A2). -Patients with symptomatic spondylolysis and postsurgical patients may benefit from rehabilitation to regain mobility to that particular region of the spine, as well to decrease the pain (5: Level of Evidence: 1A). -daily stabilization, strength, flexibility, and functional movement are the four stages in which the rehabilitation program should progress. -It can be necessary during the conservative phase to take extreme care to avoid rotational shearing motions and extensions, because they cause stress on the structures of the lamina (15: Level of Evidence: A1). The maintenance of pelvic tilt is used during strength and flexibility activities to avoid this stress. Functional activities and more aggressive strengthening are added after the acute symptoms subside and when a certain base of stability establishes. • strengthening of the trunk (5: Level of Evidence: A1). -Core stabilization must be added to the therapy and include exercises to increase the strength and stability of the M. Erector Spinae, M. Quadratus Lumborum, Mm. Internal/External Oblique Abdominis and M. Serratus Anterior. (9: Level of Evidence: A2). -Activities of daily living and postural awareness has to be added to the program. Patients with acute symptoms should be instructed in comfortable positions and postures (during sleeping, sitting, lying, standing, walking and picking up objects) that are safe for the spinal structures and introduced to gentle trunk exercises (2: Level of Evidence: A2). -To control the spondylolysis area, neuromuscular stabilization techniques, including activation of the M. Transversus Abdominis and other core stabilizer muscles must be emphasized (6: Level of Evidence: A1), (9: Level of Evidence: A2). -To reduce pressure on the pars interarticularis, it is important to teach the patient to stand in a neutral spine position, therefore, controlling pelvic tilts is an appointed exercise. -To enhance control range of sensitivity and to gain strength, limited ranges of motion and isometric holds in various positions are recommended. -To prepare the patient for future functional activities, strength, flexibility and endurance training must be progressed, as the inflammation and pain subside. coordination, balance and coordination exercises are added as plyometric and proprioceptive parts. functional exercises are incorporated to allow the natural execution of functional daily activities, these are through home exercises supported using various equipment (hand weights, stability balls, foam rolers,..) (: Level of Evidence: 1A). The individuals have to be encourage to resume activities as tolerated (2: Level of Evidence: 2A). the patient is recommend in a home exercise program for daily practice and continue independently after the completion of rehabilitation. In some cases the use of bracing is recommended momentarily in the early stage to control the pain and mobility (6: Level of Evidence: 1A). It’s very important that the patient’s work place undergoes an ergonomic evaluation and that he/she is educated in proper body mechanics. These changes are meant to assist the employee’s return to work (2: Level of Evidence: 2A). 2. Standaert C.J. and Herring S.A Herring. Spondylolysis: a critical review. Br J Sports Med. 2000;34:415-422. 4. MacAuley D., Best T., Evidence-based Sports Medicine, Blackwell Publishing, 2007, p. 282. 5. Morita T. et al. Lumbar Spondylolysis in children and adolescents. J. Bone Joint Surg. 1995;77-B-620-625.Level of evidence: 1B. 6. Peer K. S. and Fascione J. M. Spondylolysis – A Review and Treatment Approach. Orthopaedic Nursing. 2007,26: 104-111. 7. Ruiz-Cotorro A. et al. Spondylolysis in young tennis players: Review. Br J. Sports Med. 2006;40:441-446. 8. Syrmou E. et al. Spondylolysis: A review and reappraisal. Hippokratia. 2010;14:1:1721. 9. Freeman B. J. C. and Debnath U. K. The management of Spondylolysis and Spondylolisthesis. Surgery for Low Back Pain. 2010:4:137-145. 14. Sairyo K, Katoh S, Takata Y, et al. MRI signal changes of the pedicle as an indicator for early diagnosis of spondylolysis in children and adolescents: a clinical and biomechanical study. The 31st Annual meeting of ISSLS, Porto, Portugal, May 31-June 5, 2004. 16. MacAuley D., Best T., Evidence-based Sports Medicine second edition, Blackwell Publishing, 2007, p. 282. 17. Depalma M.J., iSpine: Evidence-based interventional spine care, Demos Medical Publishing, 2011, p. 156-157. 19. Aufderheide A.C., Rodriguez-Martin C., The Cambridge Encyclopedia Of Human Paleopathology, Cambridge University Press, 1998, p. 63.
official journal of Isfahan University of Medical Sciences 20.2 (2015): 150.